To provide a better learning experience the group formation plugin offers a great possibilities to optimize the composition of learning groups working together on the assigned (or selected) tasks. It is designed to cover three most frequent and relevant scenarios required in university courses. Depending on the selected scenario, the plugin uses three different approaches by generating dynamic questionnaires. The questionnaires inquire several personal-dependent relevant criteria such as motivation, goal setting, character, team performance and prior knowledge. The collected data is used by the GroupAL algorithm to form groups optimizing the learning outcome for all participants in all groups. Project teams - work intensively together to finish a project (e.g. conduct a study, delivery of a report, etc.). Homework groups - complete (smaller) assignments in regular intervals (often weekly) as a preparation for examination. Presentation groups - work together for a relatively short time period to finish a presentation (usually to be held in class). At the Presentation groups scenario, the course executive has to define topics, which students sort to regarding their personal priority of interest. To lower the effort barrier, group formation offers students to export/import their answers for reuse in other courses. The questionnaires are available in English and German. Unzip the zip file in the “mod” folder of the Moodle directory and, if necessary, rename the folder to "groupformation". Then visit your Moodle server's Site Administration -> Notifications page and Upgrade Moodles database, -- OR -- Go to Administration > Site Administration > Install add-ons to install the Groupformation module directly from your Moodle installation. 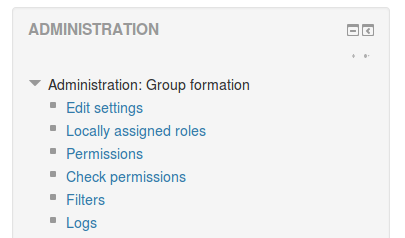 In Moodle start the edit mode and create the Groupformation activity. Choose one of the three scenarios and enter the maximum size or number of groups. You can include preknowledges which may be important for the activity. Depending on the scenario you have choosen, preknowledges will help to improve the matching of the groups. After you done all the settings a questionnaire will be created. When the students completed their questionnaire you can end the activity and start the groupformation algorithm. You also can see how long the questionnaire is available to the students and end or start it at any time. In the "Group formation" tab you can start the algorithm to forming groups. In the settings you can choose to exclude the student who not answered the questionnaire. Tutors, teachers or other not relevant roles in Moodle assigned to the course are excluded from the group formation. When you start the algorithm to forming groups, it can take a while till it finishes(depending on server and the number of students it could take up to 30 min). If you wish to, you will be notified by email when the group formation is done. After the group formation succeeded you can see the preview of the groups and their quality, which is the performance index(GPI). You can edit the groups by moving the students from group to group. If you satisfied with the result you can adopt the groups to Moodle. If not, you can discard the results and start the algorithm again. Here you have a preview of the questionnaire. Your answers will not be saved. Because of your role as a tutor(or similar) you not taking participation in the group formation. In the navigation side bar, which is usually to your right, you can adjust the settings. Some settings will be disabled, as soon as students started to complete the questionnaire. All settings which have no effect to the questionnaire would be still available. Those are for example the group size or number and the time period in which the questionnaire is available to the students. As Moodle site admin, go to Site administration > Plugins > Activity Modules > groupformation. Archiving time: Groupformations will aoutmatically be archived (anonymized and removal of individual users answers) after the set time. Participant code: (experimental) In case you plan to map the users' answers to other study data conducted, let students enter a participant code at the beginning of the group formation questionnaire. The format is: lldddd (l=letter, d=digit). This data can then be found in the Moodle database for each participant. As a developer you might want to edit the questionnaire content or configure the GroupAL implementation. For manipulation of the properties and configuration of the questionnaire and GroupAL algorithm, take a look at the define_file.php (https://github.com/moodlepeers/moodle-mod_groupformation/blob/master/classes/util/define_file.php). You can edit the categories of the questionnaire and the criteria that are used for the GroupAL algorithm. For manipulation of the questions of each category, take a look at the directory xml_question (https://github.com/moodlepeers/moodle-mod_groupformation/tree/master/xml_question). You can edit the xml files and add additional categories and languages. The groupformation plugin relies on the custom library groupAL which can be found in the subfolder ./lib of the plugin. The groupal algorithm is used by the job_manager.php (https://github.com/moodlepeers/moodle-mod_groupformation/blob/master/classes/moodle_interface/job_manager.php) file. You can edit the used matcher and implement further algorithm types. The plugin asks participants for personality traits via questionaaire. This data is stored until course end or deletetion of activity or until 365 days passed (see installation wide settings; only works if cron is enabled). Make sure your university/organization regulations allow asking and storing of such personal information. The answers of individuals are never shown to the course administrators, but to the user himself. Don't hesistate to contact us at team[at]moodlepeers.de for further assistance. Thanks for sharing your code with us - I've just taken a very quick general look at your code and found a few security issues that should be resolved before this can be approved in the plugins database, I have reported these issues into your github tracker. Once you have addressed these issues please upload a version with the fixes here and someone will take another look. Thank you for your patience with the review process. Thanks for resolving those issues - would you mind adding travis-ci support to your plugin? This runs all the automated testing tools and codechecker processes on your code - more info here: https://moodle.org/mod/forum/discuss.php?d=323384 You don't need to fix all the problems it finds (I tend to ignore a lot of the php mess detector violations in my own plugins) but seeing these reports helps a lot with the plugin review process. Please adding a full description of the plugin. You can describe the plugin's features, purpose and typical usage scenarios there, for example. Please add a screenshot of your plugin to help folks get an idea of what it looks like when installed. Thanks for checking our code. We added a travis-ci support and revised all errors before our last re-approval request. Is there anything else we can do to speed up the process or to help you on code checking? Thanks guys for sharing the plugin with the community, and sorry for the delays with the reviews. I just tried to install your plugin but it fails badly due to some malicious dependency on non-standard library. I reported details to your tracker as issues #3. Please make sure to test the functionality on clean Moodle installation. If you had unit tests and / or behat tests that the travis could actually check, you would have caught this much earlier I believe. For now I have to mark this as needing more work to clarify the issue with the groupal library. Thank you for the reply David. The plugin needs the non-standard library "moodle-lib_groupal" which is an algorithm to build groups. We pointed on the dependency in the README.md file and in the plugin description on Moodle in the "Before Installation" part. Is there another standard procedure on that issue? We tested the plugin with the groupal library on our university and want to share it with the community. Well. Thing is, as per policy (which has been set up for good reasons), plugins that need such non-standard installation steps can be approved here only in a special category. Among other consequences, they can't be installed easily via the administration UI then. This is to protect administrators from putting their site into unstable state. Such a procedure is mostly used for experimental plugins that need special core modifications etc. But in your case, I do not really understand why that is needed. Why is not the groupal library simply part of the of the module package itself? Or, if there are really valid reason for not packaging together (such as the same library is used by multiple plugins), it is better to wrap the library into a standalone plugin (of the type tool or local, for example), submit they all to the plugins directory and declare the dependency in the module's version.php. Then attempting to install the module would install the library. a couple of weeks ago (11. October) we added the revised version that passes all travis-ci checks and does not depend on any other installation any more (policy conform). We would highly appreciate to get the plugin accepted as it is nominated for an award and will propably get high attention at November 23 and afterwards. Thanks guys for the new version, and for the patience. I was able to successfully test the plugin. And I must admit I like the idea of it. It is clear that the current version has been written for a particular use-case and requirements. But there is a way to customize it and eventually in the future, make all the questionnaire questions fully editable via the UI without the need to touch the XML files. While testing the functionality and reviewing the code, I spotted couple of issues that you might want to have fixed in a future version. None of them looks like an approval blocker for me though. I am happy to approve this now so you can get feedback from wider community. You are cleared to land, welcome to the Plugins directory. We are currently working on releases for Moodle 3.4 and Moodle 3.5. Sorry for the long wait. We released a new version for Moodle 3.4 and Moodle 3.5 today - Enjoy and please use the issue tracker on github.com to inform us about problems, concerns or feedback.